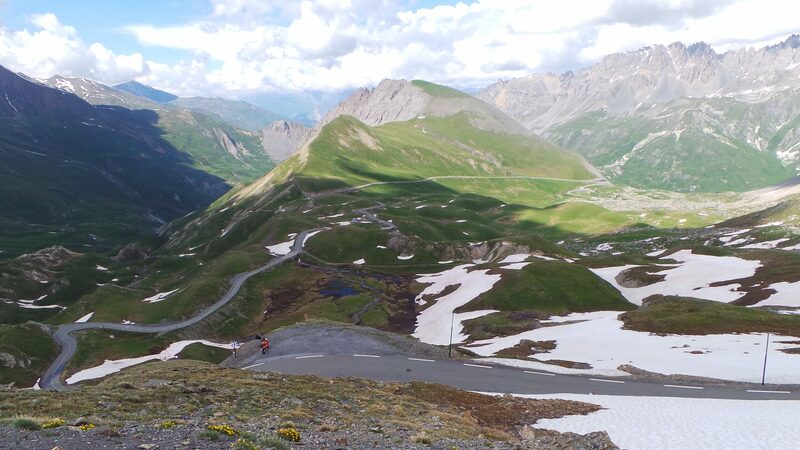 I originally planned this trip to follow the route of the Marmotte, but then changed my mind and plotted a ‘shortcut’ down the Croix de Fer towards the Télégraphe / Galibier. After all, the passage from the foot of the Glandon in Saint-Étienne-de-Cuines, through the valley to Saint-Jean-de-Maurienne and onwards to Saint-Michel-de-Maurienne, is basically just adding (a lot of) miles to the trip. In the end, I changed this stage to not include the downhill and / or side trip over the Mollard, and I transferred from the top of the Croix de Fer to Saint-Michel-de-Maurienne by car because it would save us (valuable) time. I enjoyed the Croix de Fer more from this end than I did from the other end two years ago. Apart from the injuries spoiling most of the fun at that time, I think this side is the better, slightly ‘easier’ one anyway. It ‘meanders’ along the l’Eau d’Olle and offers no hairpin sections, other than the one downhill passed le Rivier and two doubles uphill, some kilometers before arriving at the magnificent Lac de Grand Maison. Apart from a few hard(er) stretches, it’s not too bad – probably the hardest stretch is the short 11, 12% section past the first descend. Information page on the Croix de Fer here. In Saint-Michel-de-Maurienne, I got back on the bike, to first take on the Télégraphe. The (short) downhill after that and the transfer through the Valloire valley are freebies, but you know you’ll pay for that later, as you still have to overcome some 1,200 altimeters. The climb up the Galibier was a rather chilly one the second half, which is also the more difficult bit, with the higher grades. I enjoyed my brief moment of reflection at the Pantani monument at Granges du Galibier to catch my breath and change cloths. And after the grueling final up the loop, the view from the top of the loop was as I remembered it, but without most of the snow this time. Garmin recording of part 2 here. Information page on the Galibier (Télégraphe) here. Trip total for today: 67.8 km / 3,548 m elevation gain.